One of the best and most natural ways to let go of the stress of your day and regenerate your energy levels is to get a good nights sleep. Unfortunately, all too many people find it not only difficult to fall asleep, but to also enjoy uninterrupted sleep. 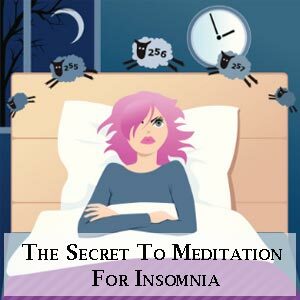 Before I learned to meditate I had very little success with finding ways to help sleep better. You know, those times where your mind just won’t shut up or your body just won’t stop tossing and turning in bed. I can’t remember how many nights I laid staring at the ceiling frustrated that my day would be ruined by lack of sleep. What I didn’t know back then was how the mind worked and what I could do to help prepare my mind and body for sleep. I even reached out to my friends to see if I could get some answers but I soon discovered that they were as lost as I was. Some of them drank alcohol to help fall asleep while others pushed themselves mentally or physically until they passed out from exhaustion. Some even took prescription medication to help relax enough to go to sleep. None of these ways were what I was looking for. I didn’t start out with meditation to help with my sleep habits. It was more a way to help clear my mind and enjoy just being for a while each day instead of madly rushing around trying to keep up with my never-ending to-do lists. What I noticed at the end of each meditation was just how calm, clear, and quiet my mind was. Not only that but my body also felt relaxed at peace. Since my meditations happened both at the start of each day and in the afternoon after work, it got me to thinking that maybe if I tried meditating before I went to bed it might help. One hour before I went to bed each night I would switch off the TV and do 30 minutes of stretching or take a warm, candle lit bath with relaxing music. Then, I would immediately follow on with a 20 to 30-minute meditation. Regardless of what meditation I did, I made sure it was one in which I could practice while laying in bed. This worked a treat for me and as I continued modifying my pre-sleep routine and testing out different activities before bed, I soon had a number of different ways to enjoy better sleep. This included things like making sure that my bed and pillow were 100% suited to me, that my room was dark and quiet, and that I hadn’t eaten or drank any stimulants such as coffee or soda at least 3 to 4 hours before bed. Not every meditation is going to help you with your sleep patterns. In fact, some of them may even do the opposite. I had to trial a number of different meditation techniques before I found what worked for me. One of the big things that everyone who can’t sleep has in common is stress and tension in their lives. The more stress you are under, the more likely you will have trouble switching off at night. That’s why it’s good to use a meditation that helps get rid of stress and tension from the mind and body. The meditation technique that I found most useful for this is a progressive muscle relaxation meditation. This can be done while laying in bed and has the dual impact of not only de-stressing the mind and body but also of letting your brain know to prepare your body for sleep. Here’s how it works. Progressive muscle relaxation is an exercise that relaxes your mind and body by progressively tensing and relaxation muscle groups throughout your entire body. You tense each muscle group without straining them, and then suddenly release the tension and feel the muscle relax. This tensing of each muscle lasts for about 5 seconds. If you have any pain or discomfort at any of the targeted muscle groups then either back off from the tension or move to the next muscle group. Throughout this exercise, you can visualize the muscles tensing and a wave of relaxation flowing over them as you release that tension. Step 1. Lay down in your bed, turn off the lights and get comfortable. Step 2. Allow your attention to focus only on your body. If you begin to notice your mind wandering, bring it back to the muscle you are working on. Step 3. Take three slow, deep breaths into your lower belly and as you exhale imagine that any tension in your body is being released through your breath. Step 4. Starting from your left foot, tense the muscles in your foot for approximately 5 seconds, and then relax them for approximately 10 seconds. Then move to your right foot and repeat the exercise. Step 5. Continue moving upwards through the body tensing and relaxing each muscle group as you come across it. Step 6. When you have completed your entire body, then do a quick scan to see if you can feel any residual tension anywhere and if you do, then repeat the exercise. Step 7. Relax completely and let yourself rest. If you haven’t already fallen asleep by the time you have completed the relaxation meditation, then you won’t be far off it. At the very least you will have cleared your body of stress and tension and you will feel more rested and relaxed than before you went to bed. The more you practice this meditation, the more benefit, and the better the quality of sleep you will have. Our mission is to empower men, women and children to stress less, focus more, and enjoy a happier, healthier life.